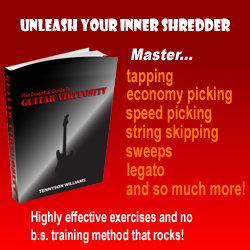 The lesson I am giving now is simple tapping technique for the beginner shredder. A lot beginner guitarists I have encountered before have asked me ”How do I play fast?”. Now most guitarists would tell you ”Practice, practice, practice!” but it’s what to practice they need to know. When me and co-owner Richard Baines started out shredding we mainly started by doing simple 3-note ”Tapping” licks, and everything progressed from there, which is why I think this is a good starting point if you’re wanting to ”shred”. The example I am going to go through is a lick from Edward Van Halen’s ”Eruption”. To ”tap” simply place your fretting hand on for example the C# note or 2nd fret on the B string, leave it there! Now, with your picking hand (you can use either finger for this but for beginners I recommend the index finger) hammer on with the tip of that finger as hard as you can (to get used to the tension) on the 9th fret G# on the same string (obviously). As you strike it ‘flick’ your finger off the string to the right as if you are applying the ‘pull off’ technique then release. Now, as soon as you have accomplished that immediately apply the ‘hammer on’ technique from the 2nd fret C# note and hammer onto the 5th fret E note.